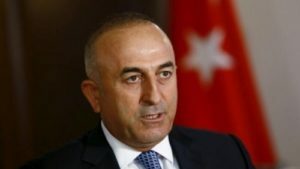 Leader of the National Unity Party (UBP) Ersin Tatar, has said that his party fully supports Turkish Foreign Minister Mevlut Cavusoglu’s view that different alternatives can be discussed in the search for the solution to the Cyprus problem. Tatar, in a written statement, said he agreed with “the taking up of other solution models other than a federation and how the two peoples will benefit from the hydrocarbons by all concerned sides, before entering a negotiations process on the Cyprus problem”. “If the continuation of peace, reaching a solution in Cyprus, the further development of Turkey-Greece relations with the solution of the Cyprus problem, and the positive effect of this to the region are important, then all alternatives should be considered” Tatar argued. He added that “the UBP fully supports the Turkish Foreign Minister’s policy for discussing the alternatives”. “In this regard, the UBP is ready to meet with the Greek Cypriot administration, Greek Cypriot political parties, the Greek government and Greek political parties”. The UBP leader argued that after the breakdown of negotiations at Crans-Montana in July 2017, he fully supported the discussion of other approaches to the problem, such as confederation and a two-state solution under the umbrella of the European Union.